Migrant populations of South Asian origin have a higher risk for chronic kidney disease than the native whites. Several formulas have been developed to estimate kidney function from serum creatinine concentration. However, none of these has been validated in the South Asian population, which generally has different muscle mass composition than whites. A population-based cross-sectional study was performed on 262 individuals who were aged ≥40 yr in Karachi, Pakistan. Reduced GFR was defined as creatinine clearance (Ccr) measured in 24-h urine collection of <60 ml/min per 1.73 m2. Creatinine excretion was compared with age- and gender-matched white individuals by comparison of observed versus expected results on the basis of a formula using t test. The agreement among Cockcroft Gault (CG) Ccr and Modification of Diet in Renal Disease (MDRD) Study GFR equations was assessed by regression analyses, and the degree of accuracy of estimated versus measured GFR was determined. Mean (95% confidence interval) creatinine excretion was 1.7 (1.0 to 2.4) mg/kg per d lower than expected for age- and gender-matched white individuals (P < 0.001). The coefficient of determination for measured Ccr on the logarithmic scale was 66.7 and 55.6% for the CG and MDRD Study equations, respectively. The proportion of estimates within 20, 30, and 50% of measured Ccr values was 47.7 versus 32.8% (P < 0.001), 64.9 versus 49.6% (P < 0.001), and 79.4 versus 72.9 (P = 0.07) for CG versus MDRD Study equations, respectively. Lower mean creatinine excretion in these individuals may explain, in part, suboptimal agreement between estimated versus measured GFR. Inclusion of terms for ethnic and racial groups other than white and black might improve the performance of GFR estimating equations. Almost one quarter of the world’s population resides in South Asia (India, Pakistan, Bangladesh, Sri Lanka, and Nepal). Evidence from the Western countries is emerging that migrant populations of South Asian origin have a higher risk for chronic kidney disease (CKD) than the native whites (1–3). Although no reliable data are available on the incidence and prevalence of CKD in South Asia, the burden of its risk factors, including hypertension and diabetes, in this population is one of the highest in the world (4,5). Therefore, the burden of CKD is expected to be equally high. Untreated CKD may progress to kidney failure and is associated with increased cardiovascular morbidity and mortality and all-cause mortality. Evidence suggests that some of these adverse outcomes can be prevented or delayed by early detection and treatment of CKD (6–10). The GFR is traditionally considered the best overall index of kidney function in health and disease (11). Early detection of CKD requires identification of individuals with reduced GFR. A GFR level of <60 ml/min per 1.73 m2 represents loss of half or more of the adult level of normal kidney function and is classified as CKD (11,12). Traditionally, GFR has been estimated by measurement of serum creatinine and creatinine excretion in a 24-h urine sample and computation of creatinine clearance (Ccr). Collection of urine for determining Ccr is difficult in clinical practice; thus, clinicians generally rely on serum creatinine alone as an index of GFR. Unfortunately, serum creatinine is affected by factors other than GFR, in particular muscle mass and meat intake, which differ in the South Asian populations compared with the white and black populations in which these factors have been studied. Several formulas have been developed to estimate GFR from serum creatinine concentration, age, gender, and body size (13–15). The drug-dosing intervals are determined on the basis of one of these formulas, the Cockcroft-Gault (CG) prediction equation. However, none of the currently available estimating equations has been validated in the South Asian population. Similarly, the utility of threshold values for serum creatinine to detect reduced GFR has not been examined in the South Asian population. We conducted this study to determine the prevalence of reduced GFR, defined as a Ccr measured in 24-h urine collection of <60 ml/min per 1.73 m2 in adults aged 40 yr or older in Karachi, Pakistan. We compared observed creatinine excretion with expected values on the basis of a predominantly white population. We compared the performance of the CG and Modification of Diet in Renal Disease (MDRD) Study equations for measured Ccr in a South Asian population. Finally, we also sought to assess the sensitivity and specificity expressed by receiver operating characteristic (ROC) curves for serum creatinine concentration, estimates of GFR from CG and MDRD Study equations for the diagnosis of reduced GFR. On the basis of the assumption that at least 30% of individuals would have Ccr of <60 ml/min, approximately 330 individuals were needed to detect this prevalence with error bounds of 2%. The sample was drawn using two-stage sampling from one of the communities (clusters of households) in the metropolitan city of Karachi, after obtaining approval from the Ethical Review Committee at the Aga Khan University. The site was chosen as this study was piggy-backed to an ongoing study of prevalence of hypertension in this community of individuals belonging to the Pashtun ethnic subgroup (4). A total of 5920 residential structures were numbered and mapped in the study cluster. Twenty-five percent (1480) of these structures (every fourth) were systematically selected. Complete listing of household members was done in 1426 households. The total number of individuals who resided in these households was 11,765, 1765 of whom were aged 40 yr or older and constituted our sampling frame. A target sample of 332 individuals, stratified by gender, was randomly selected for the study, and informed consent was sought. A total of 295 individuals consented to participate. Trained community health workers paid home visits to the selected individuals to invite and motivate them for their participation in the study and to obtain informed consent. To improve participation, refreshment was given after laboratory sampling, and the results of the laboratory tests were delivered to all participants with advice. Instructions on 24-h collection of urine were given, and bottles for the same were provided. All individuals were evaluated at the community clinic in their areas by trained nurses. The evaluation included the following: (1) administration of questionnaire that details smoking status, food frequency questionnaire, and other lifestyle factors and Rose questionnaire for angina; (2) assessment of BP with calibrated automated device (Omron HEM-737 Blood Pressure Monitor) in sitting position after 5 min of rest; (3) anthropometry (height, weight); (4) laboratory tests including fasting blood glucose (Synchron Cx-7/Delta, Beckman, Ramsey, MN) and serum and 24-h urine creatinine (Jaffe method, Beckman DU); and (5) an ECG. All measurements were performed to a standard protocol that conformed to the international standards for definitions and measurements. The study was conducted over 1 yr (2001 to 2002). Measured urine creatinine excretion (mg/kg per d) was computed on the basis of 24-h urine collection urine creatinine (mg/dl) times urine volume (dl/d) divided by body weight (kg). 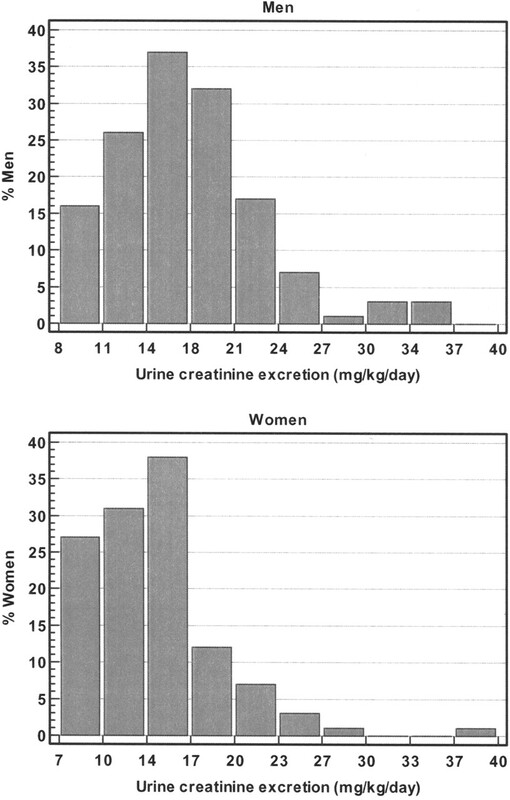 Observed urine creatinine excretion (mg/kg per d) was computed as 28.2 − [0.172 × age (years)] for men and 21.9 − [0.115 × age (years)] for women (16). Measured Ccr (ml/min per 1.73 m2) was calculated as creatinine excretion (mg/kg per d) divided by serum creatinine (mg/dl) divided by 14.4 (min/d per dl/ml). Values were adjusted to standard body surface area (BSA) of 1.73 m2 by multiplying by BSA/1.73. BSA was computed using the formula BSA = height0.725 (cm) × body weight0.425 (kg) × 0.007184. Estimated Ccr using the CG equation (Ccr, ml/min) was calculated as (140 − age) × (weight in kg)/serum creatinine (mg/dl) × 72 × (0.85 if female) (16). The estimated values of Ccr were adjusted to BSA of 1.73 m2. Estimated GFR using the MDRD Study equation (ml/min per 1.73 m2) was calculated as 186 × [serum creatinine (mg/dl)]−1.154 × (age)−0.203 × (0.742 if female) (13,17). The MDRD Study equation provides an estimate of GFR adjusted to BSA of 1.73 m2; further computation is not required. Reduced GFR was defined as measured Ccr of <60 ml/min per 1.73 m2. SPSS and Medcalc were used for all analyses (18,19). The prevalence (95% confidence interval [CI]) of reduced GFR was determined for the screened population. Estimated creatinine excretion was compared with age- and gender-matched expected values using the formulas derived by Walser using two-tailed t test (20). The association between measured Ccr and estimated GFR on the basis of the CG and MDRD Study GFR equations was assessed by ordinary linear regression and Passing and Bablok regression analyses. Comparisons between CG Ccr and MDRD Study estimated GFR and measured Ccr were assessed by measuring (1) bias (mean estimated versus measured value), (2) precision (coefficient of determination of log-estimated versus log-measured value), and (3) accuracy (proportion of estimates within 20, 30, and 50% of measured values). Sensitivity and specificity of serum creatinine and estimated GFR from CG and MDRD Study equations were expressed by ROC curves for the diagnosis of reduced GFR (21). A total of 332 individuals who were aged 40 yr or older were invited to enroll in the study. All individuals belonged to Pashtun ethnic subgroup (4). Twenty-four-hour urine samples were provided by 295 individuals (161 men and 134 women). The 24-h mean (95% CI) urine volume was 1.3 L/d (1.2 to 1.4 L/d). The 24-h mean urine creatinine excretion (95% CI) was 16.1 (15.2 to 17.1) mg/kg per d in men and 13.1 (12.2 to 14.1) mg/kg per d in women (Figure 1). Samples with low levels of urine creatinine (gender-specific level of 10th percentile or less [9 mg/kg for men and 7 mg/kg for women]) were excluded from the analysis because of suspicion of undercollection. Thus, the final sample size was 262 individuals. Distribution of urine creatinine excretion. The sociodemographic and clinical characteristics of individuals who were included in the final analysis are shown in Table 1. The overall prevalence (95% CI) of reduced GFR was 29.9% (24.2 to 35.1%): 26.7% (20.1 to 34.6%) in men and 32.5% (24.8 to 41.3%) in women. Creatinine excretion is shown in Figure 1. Mean observed creatinine excretion in men and women was 17.5 and 14.1 mg/kg per d in men and women, respectively, compared with mean expected values of 19.0 and 16.3 mg/kg per d, respectively (P < 0.002 and P < 0.001, respectively). Mean (95% CI) difference between observed and expected creatinine excretion was 1.5 (0.5 to 2.5) in men and 2.1 (1.2 to 3.0) in women. The bias in overestimating GFR by the CG and MDRD Study equations compared with measured Ccr was 6.1 and 8.2 ml/min per 1.73 m2, respectively. Although there seemed to be relatively more overestimation of Ccr by MDRD Study GFR at lower levels of Ccr, the test for nonlinearity on using Passing and Bablok regression analysis was NS (P > 0.1), indicating no significant variation at lower versus higher levels of Ccr. The coefficient of determination for measured Ccr on the logarithmic scale was 66.7 and 55.6% for the CG and MDRD Study equations, respectively. The proportion of estimates within 20, 30, and 50% of measured Ccr values was 47.7 versus 32.8 (P < 0.001), 64.9 versus 49.6 (P < 0.001), and 79.4 versus 72.9 (P = 0.07) for CG versus MDRD Study equations, respectively. The ROC curves in Figure 2 and Tables 2, 3, and 4 illustrate the sensitivity and the specificity of serum creatinine for the diagnosis of decreased GFR. Pair-wise comparison of areas under the ROC curves showed that CG equation was superior to serum creatinine (P = 0.004) in men but not in women (P = 0.06). However, differences between ROC curves for MDRD Study GFR compared with serum creatinine was NS in men (P = 0.21) or women (P = 0.54). Comparison of area under the receiver operating characteristic (ROC) curve among SCr, Modification of Diet in Renal Disease (MDRD) study GFR, and Cockcroft Gault (CG) creatinine clearance (Ccr) equations for reduced GFR. (A) ROC curve for sensitivity and specificity of levels of SCr for reduced GFR in men (reduced GFR defined as measured Ccr <60 ml/min per 1.73 m2). (B) ROC curve for sensitivity and specificity of levels of SCr for reduced GFR in women (reduced GFR defined as measured Ccr <60 ml/min per 1.73 m2). This is the first report on the prevalence of reduced GFR in a population-based sample from South Asia. We found that the prevalence of reduced GFR was estimated as 29.9% (24.2 to 35.1%) in individuals who were aged 40 yr or older. In addition, we found lower age- and gender-matched mean values of creatinine excretion, compared with a predominantly white population. Furthermore, validation of GFR estimation equations against measured Ccr and cutoff values of serum creatinine and GFR estimates using the CG and MDRD Study equations for detecting reduced GFR are being reported for the first time in a South Asian population. Although the agreement among values of CG Ccr and MDRD Study GFR prediction equations with measured Ccr was not as good as reported in other populations, both equations performed better than serum creatinine. Although being reported for the first time, the alarmingly high prevalence of reduced GFR in adult men and women in Pakistan is not unexpected as the prevalence of risk factors of CKD including hypertension and diabetes is one of the highest reported worldwide (22). The National Health Survey of Pakistan (1990 to 1994) showed that one of three individuals aged 45 yr or older has hypertension. The prevalence of diabetes in South Asian countries is two- to three-fold higher than that reported for Western countries (5). The high prevalence of other chronic diseases in this population suggests that the burden of CKD is likely to be high. Unless prompt attention is given to prevention of chronic diseases, the rising burden of these dangerous conditions would reflect in an even higher burden of CKD in this vulnerable population. Undercollection of 24-h urine samples can lead to underestimation of measured Ccr, thus overestimating the prevalence of reduced GFR. The mean urine creatinine excretion rate in our study were generally lower (mean [95% CI] levels, 16.1 mg/kg [15.2 to 17.1] mg/kg per d in men and 13.1 [12.2 to 14.1] mg/kg per d in women; Figure 1) compared with the estimated levels for age- and gender-matched white individuals. This suggests that undercollection of urine samples could be a potential source of bias in our study. For a number of reasons, we believe that this is not the likely explanation. In our study, trained community research workers emphasized adequacy of urine collection to the participants and advised appropriate recollection in cases of doubt. Furthermore, we deleted samples that contained values of 24-h urine creatinine excretion at the 10th percentile or less of the distribution of urine creatinine levels in the study population. The distribution of urine volume did not seem to vary significantly across lower and higher values of measured Ccr (data not shown). Moreover, the relationship between predicted GFR and measured Ccr did not seem to vary significantly according to the level of measured Ccr. Creatinine is produced nonenzymatically in skeletal muscle, and the amount of creatinine production and, therefore, 24-h excretion of creatinine, are directly related to muscle mass (23). Furthermore, dietary meat intake has been shown to influence serum creatinine levels (24,25). It is likely that the lower creatinine excretion observed in our study reflects differences in muscle mass and dietary meat intake. Asians generally have lower muscle mass for body weight than whites and lower meat intake (26–28). Population-based studies would be necessary to determine true age- and gender-specific values for creatinine excretion in South Asia. A number of GFR estimating equations have been developed to overcome some of the limitations of estimating GFR from serum creatinine. The CG equation was developed in 1973 and is used widely. A newer equation, the MDRD Study equation, was developed in 1999 and since then has been validated in a number of populations, has been rigorously developed and validated, and is now recommended by the National Institute of Diabetes and Digestive and Kidney Diseases, the National Kidney Foundation (NKF), and American Society of Nephrology for use in clinical practice (13,17). However, neither of these equations was developed or validated in the South Asian population. Although neither of these equations performed as well in our study population, both were superior to serum creatinine level alone for diagnosis of reduced GFR. Early detection and treatment of CKD can prevent some of its complications (6–10). This is especially pertinent to developing countries, where support for kidney replacement therapy is lacking for the vast majority of patients with advanced kidney disease (29). Elevated levels of serum creatinine mark the presence of reduction in GFR. 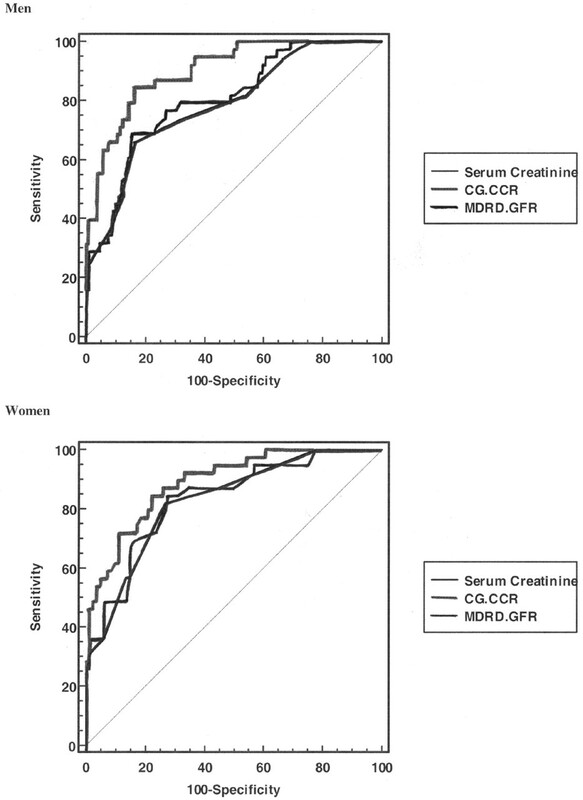 Serum creatinine levels >1.2 mg/dl in women and 1.6 mg/dl in men have been found to be approximately 90% sensitive for detecting GFR of <60 ml/min per 1.73 m2 (30). Even higher threshold levels are recommended for screening for reduced GFR in the NKF-sponsored Kidney Early Evaluation Program (31). However, these cutoff levels are based on data from a white population (30). Our data suggest that the levels of serum creatinine indicating reduced GFR in South Asian population are lower. Cutoff values of serum creatinine of 0.91 mg/dl yielded sensitivity and specificity of 74 and 68% for the presence of reduced GFR in men, and a value of 0.73 mg/dl yielded 82 and 73% of the same in women, respectively. Even lower cutoff values of serum creatinine were associated with higher sensitivity. Therefore, using cutoff values for serum creatinine as suggested for primarily white populations would fail to detect approximately 80% of patients of South Asian origin with early-reduced GFR. This difference is probably due to lower creatinine excretion. Data from the West suggest that a greater proportion of South Asians than native whites develop kidney failure (3). It is possible that this is due in part to late detection of CKD based on a level of serum creatinine that may be too high for this population. Our findings emphasize the importance of using a lower threshold level of serum creatinine. Our findings suggest that it would be even better to use GFR estimating equations for evaluation of reduced GFR in South Asians. We recommend that laboratories report values of estimated GFR in addition to serum creatinine levels. Levels of estimated GFR <70 and 80 ml/min per 1.73 m2 in men and women, respectively, should prompt further evaluation and management as per the NKF Kidney Disease Outcomes Quality Initiative action plan for CKD (32). Our analyses have limitations. First, the gold standard for diagnosis of reduced GFR was based on measured Ccr and not measured GFR. However, Ccr tends to overestimate GFR, especially in patients with reduced GFR (13). Therefore, the true prevalence of reduced GFR is likely to be been greater. However, undercollection of 24-h urine samples can lead to underestimation of measured Ccr and, thus, overestimation of reduced GFR. As discussed, although we cannot exclude the possibility that undercollection of urine samples contributed to the high prevalence of decreased GFR observed in our study, we believe that it is unlikely to be a major source of bias. Second, diagnosis of CKD requires persistent reduction in GFR for at least 3 mo (12). The estimates of reduced GFR in our study are based on a single measurement of Ccr. Nevertheless, single measurements of serum creatinine are considered appropriate for epidemiologic and screening purposes (31). Third, GFR estimation equations have been developed to estimate GFR against the gold standard of measured GFR and have been shown to underestimate measured Ccr by approximately 15% (13). This may explain the poorer performance of the MDRD Study compared with the CG equation, which was developed to estimate Ccr. Moreover, the assay for serum creatinine in our study has not been calibrated to the laboratories used for developing these equations. Despite these limitations, both CG and MDRD Study equations performed better than serum creatinine alone (Figure 2). Nonetheless, GFR estimating equations could likely be improved by including terms for populations that have lower muscle mass and meat intake. Finally, all individuals in our study belonged to the Pashtun ethnic subgroup, which has been reported to have relatively higher body mass index than some of the other South Asian ethnic subgroups; GFR estimation equations need validation in the latter subgroups (4). In conclusion, there is a high prevalence of reduced GFR in the adult population of urban Pakistan. GFR estimates using serum creatinine and the CG or MDRD Study equations are better predictors of reduced GFR than serum creatinine alone. Our findings underscore the importance or reporting estimated GFR using current equations and of further improving GFR estimating equations in the South Asian population.